Conservation@Home Cook County recognizes and certifies properties that demonstrate environmentally sound landscape practices. This program is brought to you by the partnership of Forest Preserves of Cook County and University of Illinois Extension. Through the Conservation@Home certification program, residents and schools of Cook County have the opportunity to shape their landscapes in a conservation-minded way with guidance and criteria provided for them. Criteria for homes and schools can be downloaded below. The biggest reward for integrating sustainable practices at your home and in your community is being aware that you are contributing to clean water, rich soil and resilient ecosystems that support people and wildlife. The Conservation@Home certificate recognizes yards and sites that are conscientiously improving their area for the environment and humanity. In 2019, Conservation@Home in Cook County expanded to include schools. To review certification criteria for schools please click here. For more information, please contact Val Kehoe at vkehoe@illinois.edu or 773.233.2900. Conservation@Home is a program of The Conservation Foundation. University of Illinois Extension is pleased to be a partner. 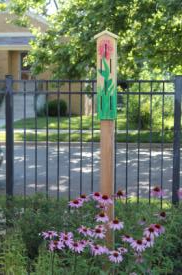 For a one-time fee of $50, certified home and school gardeners will receive a Conservation@Home sign to post in their yard/schoolyard, a subscription to our seasonal newsletter, and receive early notifications of upcoming plants sales and Conservation@Home programs in the Forest Preserves. *Fee waivers are available for those with financial need. Before applying, please review Conservation@Home Criteria. To apply for Conservation@Home certification click here. Ever wonder what makes ‘good’ soil? Or how to create healthy soils in your landscape? Join University of Illinois Extension Conservation@Home team as we explore the soil science for native, ornamental plantings, in time for this growing season. Program is free but, registration is required. Please click here to register. River Trail Nature Center, Northbrook - Friday, 4/12 10 a.m. – 12 p.m. Sand Ridge Nature Center, South Holland – Saturday, 4/27 10 a.m. – 12 p.m.
Little Red Schoolhouse Nature Center, Willow Springs – Saturday, 6/15 10 a.m. – 12 p.m. Please plan on bringing a soil sample(s) from your yard. Instructions for collecting a soil sample can be found here. Review this criteria list before submitting your application. River Trail Nature Center, Northbrook - Friday, 4/12 10 a.m. – 12 p.m. Sand Ridge Nature Center, South Holland – Saturday, 4/27 10 a.m. – 12 p.m. Little Red Schoolhouse Nature Center, Willow Springs – Saturday, 6/15 10 a.m. – 12 p.m.